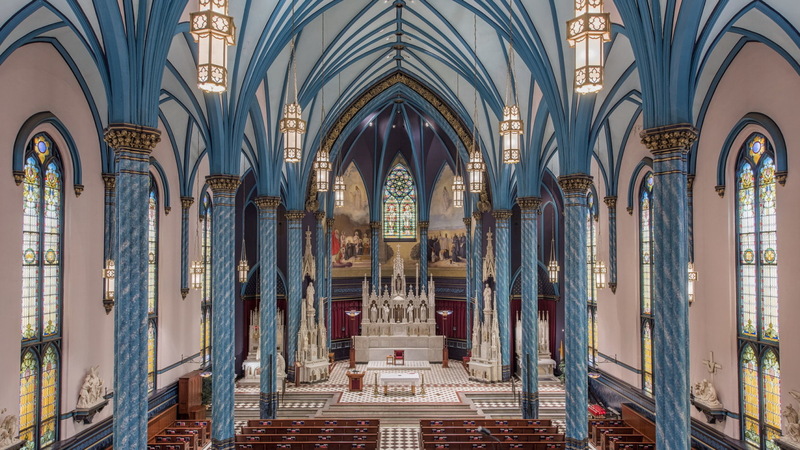 St. Francis Xavier Church and St. Peter in Chains Cathedral both trace their origins to Christ Church, Cincinnati’s first Catholic church. In 1811 Fr. Edward Fenwick O.P. visited the Catholics of Cincinnati. At this time there was no Catholic church so the Mass was celebrated at the home of Michael Scott, which was located on the west side of Walnut between 3rd and 4th Streets. Scott “dreamt of building a Catholic church in Cincinnati” which he hoped might entice a priest to take up residence in Cincinnati. Because the small number of Catholics in Cincinnati did not have the necessary means to finance even a modest church, Scott sought financial assistance from the wealthier Catholics of Maryland. Through his efforts and the generosity of Maryland Catholics sufficient funds were obtained to purchase land and construct a wooden frame church. By 1819 the Cincinnati Catholics established the congregation of Christ Church and purchased two plots of land from James Findlay for the sum of $1,200. At that time, the land, on the corner of Vine and Liberty Streets where St. Francis Seraph now sits, was outside of the city limits. Michael Scott drew up the plans for the first Catholic church in Cincinnati and William Reilly of Alexandria, KY built the wooden structure which measured approximately 55 feet by 30 feet. Mass was celebrated for the first time in Christ Church on Easter Sunday, 1819. Bishop Edward D. Fenwick O.P. and his small party departed by horse and wagon from St. Rose in Kentucky, and after having swum across the swollen Ohio river, arrived on the evening of Saturday, March 23, 1822. Because the Liberty Street location was too far from his residence, Fenwick had the entire church placed on rollers and moved to the present location on Sycamore Street.